I was doing really, really well when it came to blogging faithfully every week. But, as I predicted, school work has taken over my life, which doesn't leave much time for crafting, blogging, or documenting my daily 'outfits'. Last week alone I had two full nights of parent/teacher conferences followed by a day-long field trip to Boston with 50 teenagers. 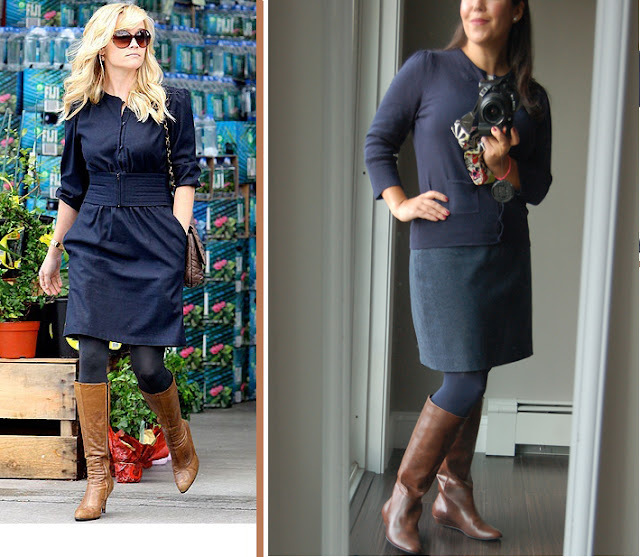 However, I do have a few things to link up to The Pleated Poppy & Real Momma, Real Style. I saw her outfit in a magazine and totally fell in love! I know I'm no Reese but I think my outfit it pretty cute nonetheless. Cardi, tights, and boots ($9!!!) are all from WalMart and the wool skirt is from H & M.
For those that don't know me, I'm the second from the left! This is my teaching team in front of the U.S.S. Constitution...they are pretty great (both the team and the ship). 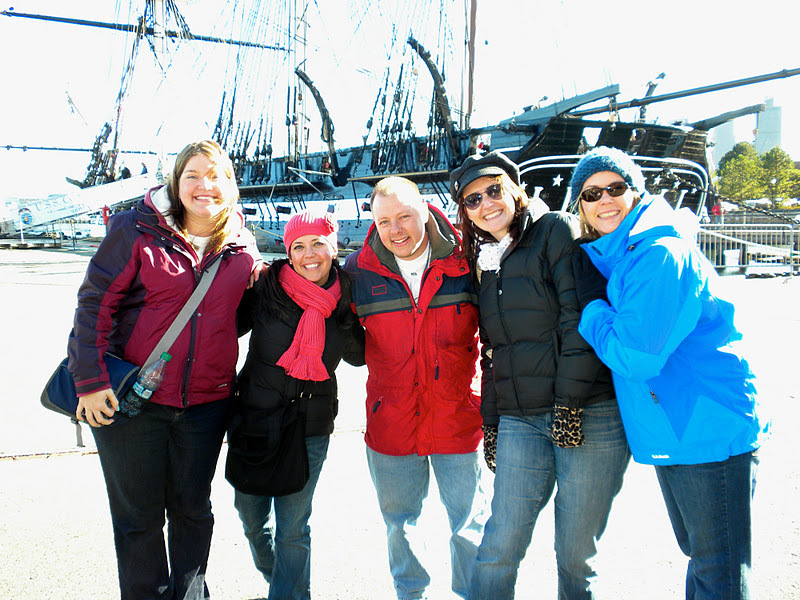 We were outside much of the day taking a walking tour of the Freedom Trail then touring the ship with our students. It was cold, thus the hat & scarf set from GAP outlet. The puff jacket is from J. Crew, messenger bag from WalMart, jeans from Delias. 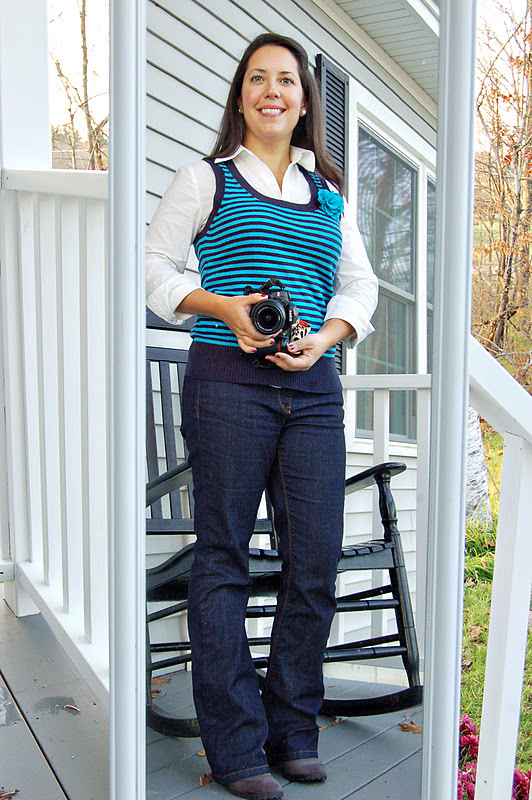 I love this outfit because it's a really comfortable work outfit. The jeans (first Wednesday of the month staff can wear jeans if we pay $1) and boots are new...bootcut jeans are from Ann Taylor Loft (they had a 40% off sale this past weekend) and the gray boots are from Target. The striped vest only cost me $5 because I had coupons to LL Bean for using their rewards credit card. 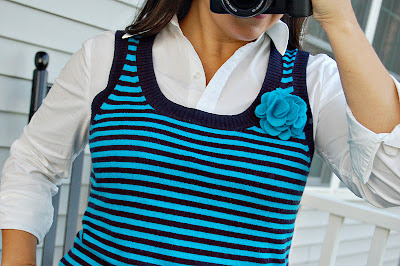 White collared shirt is from GAP outlet and I made the felt flower pin using a tutorial from Jones Design Company. The boots are great... for $9 bucks!?! And I'll admit that I giggled a bit when I read that you pay $1 to wear jeans on the first Wed. of the month... but I bet that money goes towards something good, plus, that's a cute outfit and I love the pin! I really, really love that striped vest...and the flower! So cute! Thanks for all your comments! Melissa, yes, the money goes to a school scholarship fund, so it's totally worth it! Carly, I thought the striped vest was really fun, too and I love turquoise! Maya,I can't take the compliment on the gloves because that's my friend and co-worker, Donna, who's sporting those in the picture! I'm the short one second from the left! The outfits are too cute! And wow you scored some great deals on everything!